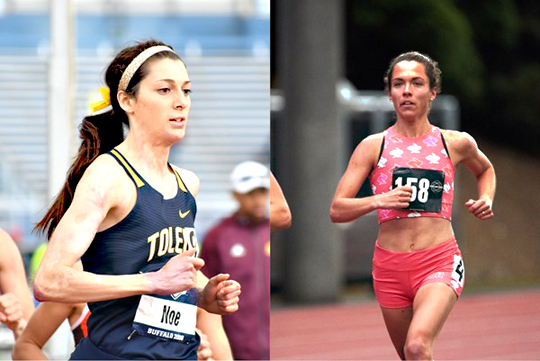 Women’s track and field student-athlete Janelle Noe and UT Assistant Coach Samantha Bluske will each represent Toledo this week at the USA Track and Field Championships in Des Moines, Iowa. Noe will compete in the first round of the 1500m Thursday, June 21, at 4:35 p.m. Eastern time. Senior Janelle Noe and Assistant Coach Samantha Bluske will compete in the 1,500m and 10K events, respectively, at the USA Track and Field Championships this week in Des Moines, Iowa. Bluske will follow in the 10K final at 8 p.m. Eastern time. “Competing in this meet is not something that most collegiate athletes get a chance to do,” Head Coach Linh Nguyen said. “With Janelle qualifying and being healthy, she wanted to go and see what she could do, and I thought it would be a great experience. The hope is that she’s back at the NCAA finals next year and contending, so running the USA Championships will be an invaluable experience for that. Noe heads into the championships following a strong performance at the NCAA Outdoor Championships, where she beat her personal record by six seconds in the 1500m prelims (4:10.83) and finished 11th in the finals after crossing the line in 4:20.37. Noe claimed the best finish by a Rocket in the NCAA Championships since April Williams took eighth in the triple jump in 2007. Noe is coming off a breakout season that saw here lower her 1,500m time by almost 20 seconds and break the Mid-American Conference record at the MAC Championship Meet with a time of 4:17.01. In addition to her success on the track, her continued recovery from an off-campus incident that occurred in 2016 that left her severely burned has gained the attention of national publications, and news outlets and fans are eager to see what’s next for the Sylvania, Ohio, native. “I’m excited to come out here to the U.S. Championships,” Noe said. “I’m able to toe the line with some of the nation’s best runners and that is an absolute amazing experience. I’m coming out here with no time or place goals in mind. I just want to go out there, try my hardest, and see where I can finish among top athletes. “It’s honestly just an amazing experience and accomplishment to qualify for this race,” she said. Bluske, who’s competing under her sponsor rabbit, last ran in the Portland Track Festival June 9. She took fifth in the 10K after finishing in a personal best 33:00.59. The competition was only Bluske’s third of the year and her first 10K since 2014. Her time narrowly missed the USA Track and Field Championship automatic qualifying mark of 33:00.00, but she made it in thanks to several scratches. Fans can follow the USA Track and Field Championships action via NBC and NBCSN, or online with an NBC Sports Gold membership. This entry was posted on Wednesday, June 20th, 2018 at 3:50 am and is filed under Athletics, Events, News .